SAULT STE. MARIE — Capital projects at the Sault Ste. 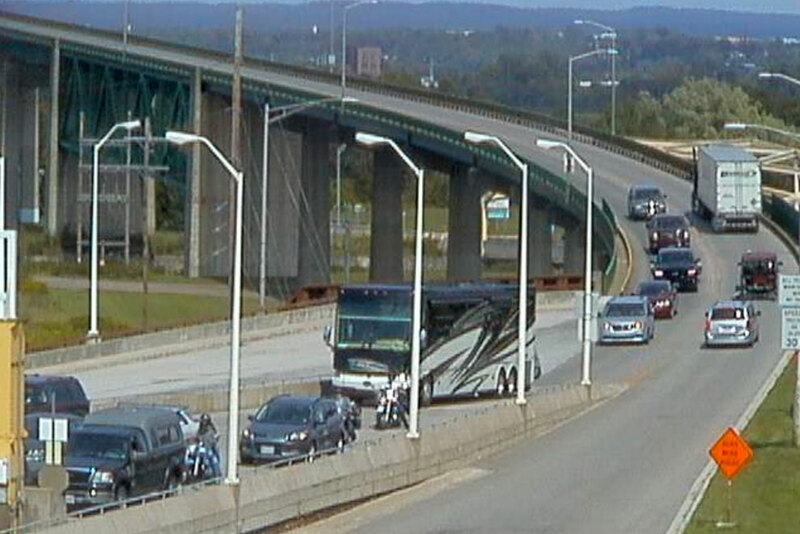 Marie International Bridge are being rescheduled in an effort take advantage of new technology and to save money. The Sault Ste. Marie Bridge Authority board, the bi-national body supervising operations of the International Bridge, had its quarterly meeting Thursday. The board received updates on bridge maintenance projects, which had been scheduled to begin this year. Painting of the bridge’s Canadian arch was slated for 2016. Bridge officials are investigating promising new alternative coatings for use in future major painting projects and the bridge’s own maintenance painting efforts. A test of a new coating system will be completed this year on several spans on the south side of the bridge. A project to replace sliding plate bearings and rocker arms was also slated for this fall. The bearings are on order, but due to the lengthy lead time to manufacture the parts, the project has been rescheduled to 2017. The scope of the contracted work is subject to ongoing negotiations with a selected contractor. Bridge staff in July also completed a flood coat sealing of the Canadian arch concrete deck, an example of the IBA’s shift to an asset-management and preventive maintenance approach. The flood coat is an epoxy sealant that fills all cracks in the deck, extending the surface life as well as improving road traction. Other deck locations on the bridge are scheduled to receive the flood coat. Share the post "Sault Ste. Marie International Bridge projects delayed until 2017"
Categories: Chippewa County and Roads.